Just one of the “Fascist concordats” is still substantially in place. Italy has got rid of the Mussolini concordat, Spain has replaced the Franco concordat, Austria has eroded through amendments the Dollfuss concordat and Portugal has scrapped the concordat made with Salazar. Only Germany still retains its Vatican concordat with Hitler. 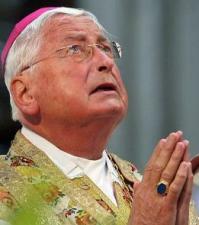 Benedict XVI's first appointment was Walter Mixa as Bishop of Augsburg but in 2010 he was forced to resign after he came under investigation for beating children in an orphanage and embezzling funds from it. Yet, as a Bishop Emeritus, his pension will now be paid by the public, (just like his monthly wage of €7900), thanks to Art. 10.1.i of the 1924 Bavarian Concordat. After World War II some German states considered the Concordat to be no longer in force. However, in 1956 the papal nuncio had the matter brought before the Constitutional Court. It decided that, although the concordat had been brought in after Hitler had suspended democracy, it was still binding. The German postwar constitution was carefully designed by the Allies to decentralise the country and hence it handed over many formerly federal powers to the individual states. Thus the federal government has lost the constitutional power to revise the concordat. Instead, it is left up to the states to renegotiate directly with the Vatican in areas like education which under their control. This allows the Vatican to push for the maximal concessions obtainable in each region of the country. The Vatican now has a web of more than 50 concordats throughout Germany concerning individual states and even individual institutions. These are further cemented by numerous statutes, regulations, ordinances and other agreements. However, the enormous power of both Catholic and Protestant churches in Germany today is not due solely to the concordats or church-state agreements. The privileges that these pacts give to the churches are amplified by another fateful German innovation. It was the 1919 Constitution of the democratic Weimar Republic which gave the churches wide latitude in substituting their own regulations for the law of the land. These articles were incorporated into the present German constitution, including Article 140 (which in the Appendix takes over Article 137 § 5 of the Weimar Constitution) confirming the status of the Catholic and Lutheran Churches as corporations under public law. At the same time Article 19 § 5 extends to these artificial persons, the rights of real ones, thus setting the stage for a conflict between individual and group rights. On the second page of the menu below several articles show how this church autonomy has let faith-based social services remove millions of Germans from the protection of many civil laws. Finally, in a landmark 2018 decision, the European Court of Justice moved to restrict the power of German churches to require that all their employees be members. It ruled that they could no longer be the sole judges of whether or not their "ethos" was threatened by employing a non-member. If they could do that, the court said, the EU anti-discrimination directives "would be deprived of effect". (In other words, the German churches can no longer mark their own exams.) Henceforth their employment decisions must be "proportional" -- they must balance their own right to religious freedom with the right of their employees not to suffer religious discrimination. In theory this means that if church employers want to avoid being sued, they can no longer make church memebership a formal requirement for positions that have nothing to do with religion, for example, administrative, cooking or cleaning jobs. In practice, however, not much seems to have changed. There is nothing to stop the churches from quietly giving preference to co-religionists. This fear of being discriminated against in the job market keeps many unwilling Germans in the church -- and forces them to pay church tax. As well as the national concordat made with the Nazi regime, every German state has at least one pact with either with the Vatican or local Catholic bishops. Over 50 German concordats currently in force. Highlights are given from one of the 18 concordats with state governments (Länder), the Brandenburg concordat. Also a list of state concordats is linked to the texts in German. In this excerpt Prof. Francis Messner looks at Germany, where relations between church and state are regulated by treaties. This means international “concordats” for the Catholic Church, and national “accords” for the other religious groups. In the last hundred years there have been three waves of these. Under the Bavarian concordat the bishop can veto all professors of Catholic theology (Art. 5 on the Catholic University) and 21 professors of philosophy, pedagogy, sociology and politics (Art. 3 on concordat chairs). These chairs are 85-90% funded by the state, yet non-Catholics need not apply, nor even a top Catholic scholar who criticised Pope Benedict. From birth to death many Germans depend on social services that are paid for by the taxpayer, but run by the church. These church institutions, both Catholic and Protestant, operate in accordance with their own religious laws and they affect both employees and clients. These stories about ordinary Germans show what it means to live in the shadow of religious laws. To keep their jobs many must endure interference in their private lives. German law opts for “church autonomy”, rather than “separation of church and state”. According to the Constitutional Court this lets the churches run huge enterprises (at public expense) where state employment laws do not apply, and the churches are free to make their own. This can mean that these employees can legally be fired if their personal lives don't conform to church rules. Dr. Carsten Frerk, an authority on church finances, reveals for the first time in English that social service employees of German religious organisations number 2.5 million and that the German churches pay for less than 10% of their “good works”, with the taxpayer left to foot the rest of the bill.